Aphrodisias is an archaeological site that covers the remains of the ancient town with the Temple to Aphrodite and the town’s marble quarries. 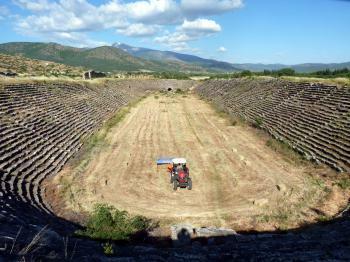 The site is representative of the expansion of Hellenistic culture in southwestern Anatolia. The town has other notable monuments such as the theatre, market square, auditorium, public baths and stadium. High quality marble was quarried a few km’s away, and turned into sculptures in the workshops of Aphrodisias. Aphrodisias is apparently scheduled by Turkey for nomination in 2017. We were in nearby Denizli to visit the inscribed site of Pamukkale/Hierapolis and were then driving down to the Selcuk area for Ephesus. So, at only 34 kms south off the direct route, it seemed worth taking in - even if we were hitting our “interest limits” on seeing Classical ruins! It turned out to be a worthwhile site, quite apart from that potential WHS “tick” banked for the future! What is less clear to me is how Turkey is deciding which of its many T List sites from this era are going forward next and how many more such cities the List can take! 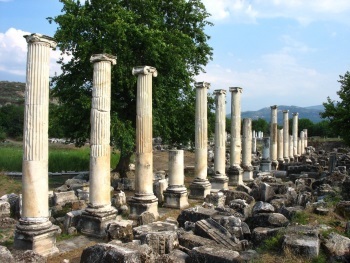 Aphrodisias has been a sacred site dating back into prehistory and in Greek times, developed as a shrine to Aphrodite, after whom it became named in 2nd/3rd C BC. The Romans conquered the area in the 1st C BC and the city was favoured by them because of its Venus/Aphrodite connections. Augustus, in particular, granted it a range of privileges declaring it “the one city in all of Asia I have selected to be my own”. The city is/was particularly famous for its sculpture – close by are quarries which yield a beautiful white and gray marble. As a result, the city became something of an artistic and cultural hub. During the Byzantine era the Shrine of Aphrodite was turned into a Christian Basilica and remains from this era constitute part of what is “on show”. Our arrival was somewhat complicated by the fact that the large overhead road sign clearly showed a right turn into the “Antik Kenti” of Aphrodisias – but immediately there was an unmanned barrier which wouldn’t open! We looked around and there was no other obvious way to go or to get the barrier to rise. Was the site closed? It was only 4 pm. However, a guy walking down the road towards us, motioned that we should ignore the barrier and take the left lane. We reached a car park only to be accosted by an irate guy who told us we should have parked in a car park on the other side of the main road (unmarked and unsigned!!) and taken his tractor-pulled shuttle coach to the site! We duly returned to the main road and found the car park where we paid our 7TL for the parking (with “free” shuttle! A nice little earner for the town). Entry to the site itself was a further 15TL (c5 Euro). Inside, the site was not busy – but it does appear that it is on the “day trip” list from coastal resorts such as Kusadasi and also a stop on the way for those going Pamukkale. In the end we spent some 2.5hours in the site and its museum before driving on to our Pension in Kusadasi. The site is pleasantly rural and spread out (but not too much) among cypress trees and fields – indeed a tractor was harvesting a crop from a field which occupied the middle of the amazing Stadium! b. The Stadium – we were to see several Roman Stadia on this trip but this one was somewhat special in its completeness and is, apparently, considered one of the best from the classical era. d.	The excavated Sebasteion – situated well below the nearby ground level, one can see how it had “disappeared” until recently. A few copy frieze panels have been constructed to give a better idea how those in the museum had been placed. Surely ICOMOS will allow these? e.	The Temple of Aphrodite - the reconstruction in 500AD to turn it into a church was major and the resulting building was far larger than the Temple it replaced. It remained a church until the Seljuk invasion in 13/14th C.
The site was obviously undergoing a lot of preparation for its potential nomination (If it really is to be considered for 2017 then its Nomination file will need to be produced by Jan 2016 – only 7 months away). This preparation seemed to consist of 2 elements. The superficial such as a completely new “crazy paved” walkway around the site and the more fundamental in the forms of various “Projects” which were advertised around the site e.g “ The Hadrianic Baths Conservation Project” and “the Mica and Ahmet Ertegun South Agora Project”. Well – we will see! Despite being emotionally anti the inscription of yet more Classical ruins I guess that “Quality” must count. One issue on which I will be interested to see how ICOMOS rules, is that of to what extent, if at all, the friezes in the Museum can be regarded as contributing to the site’s OUV. Historical Graffiti: "graffiti were primarily made by artists and workers who visited the theater, the stadium, and the markets with their implements"